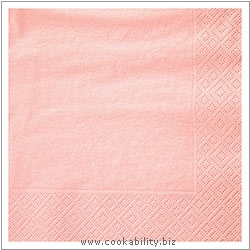 A range of good quality quarterfold 3 ply paper napkins. Excellent absorbency and wiping power. The design is plain with a subtle embossed dot pattern border. Supplied as a packet of 15. Each napkin is square and unfolds to the dimensions indicated below.